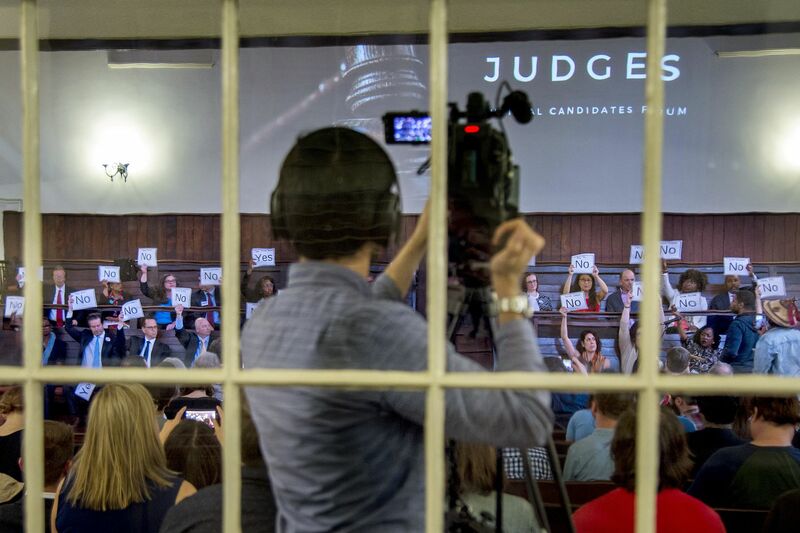 A coalition of partners in the Judge Accountability Table seeking to push judges toward criminal-justice reform hold a "Judge the Judges: Candidates Forum" at the Friends Center on Monday. The judicial candidates hold up signs — "Yes" or "No" — indicating their agreement on various questions pertaining to justice reform. Kay Yu (left) a candidate for judge in the Philadelphia Court of Common Pleas, speaks during a "Judge the Judges: Candidates Forum" at the Friends Center on Monday. All told, 23 candidates participated, many of them chasing one another to the left as they answered the single open-ended question asked at the forum: “What can the courts do to heal the harms caused to our communities by the criminal justice system?” Not one of them rejected the premise. “The judges that do the most to heal society are the ones that create the least amount of harm ... and give sentences that are restorative and aren’t punitive,” said Gregory Weyer, a criminal defense lawyer also running for Common Pleas Court. Janine Momasso, a family law attorney and aspiring Common Pleas Court judge, said one important step would be to roll back probation terms that can last years after a person has served jail or prison time, making it more difficult to remain employed. “Probation can be, to me, double jeopardy in a way,” she said. How this initiative will inform voters on Election Day is not clear, though organizers said more events are in the works. Though some of the Judicial Accountability organizers are nonprofits and therefore unable to support specific political campaigns, other groups, including Reclaim, will be releasing lists of endorsed candidates. Katia Perez of the Latinx organization Make the Road Pennsylvania said she recognizes this effort may come too late to have a sizable impact on this year’s elections. But she’s thinking long-term.